I've had a thing for rompers lately. Not for myself. No, I'm not fashionista enough to go there. But on Iris, they make me downright giddy! 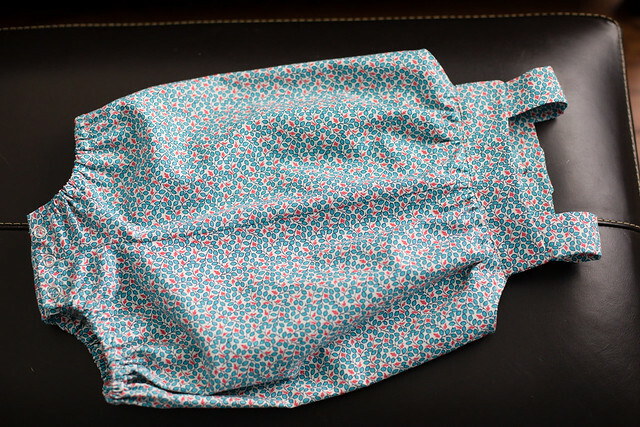 A romper was on my must-sew list. 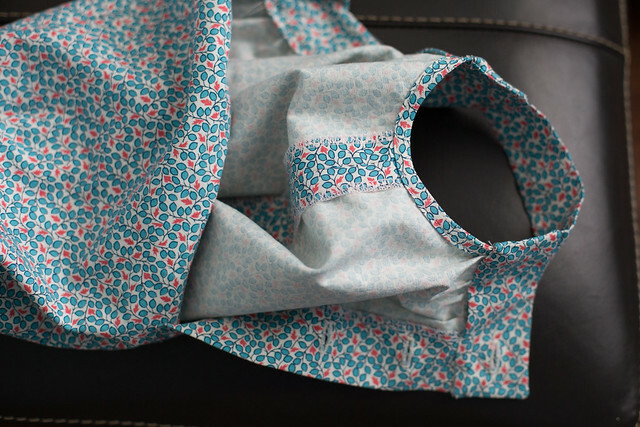 I used Kwik Sew 3776 . To me, this looked like a pretty simple pattern. I thought it would come together in a hour or so, a lot like this did. And this would be why I have a reputation around here for being a chronic under-estimator. It's why we're always up until the wee hours of the night packing any time we go on a trip. I overestimate how quickly I can get these things done. This pattern was more work than I had expected, but the instructions were fantastic and the finishing was beautiful. I was a little confused on the finishing on the plackets, so I just serged my raw edges (see above photo) and hoped for the best. Thankfully that worked! It closes with four buttons in the back. The fabric I used for this pattern is Shelburne Falls Vine and Leaf Maple. I like how delicate and timeless this print is. It feels like something I could hold onto for my kids' kids someday. If I were to make this again, I'd probably add an inch or so in length. It fits her perfectly right now, but I like to make her clothes to have some growing room. 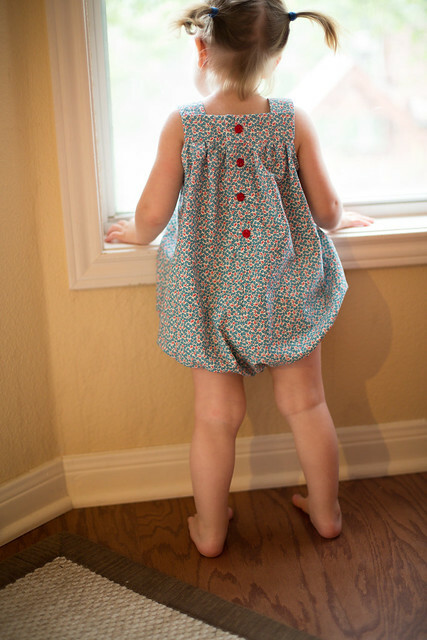 In my opinion, the romper cuteness factor is through the roof and this pattern was a lot of fun to sew! I'd definitely recommend it! 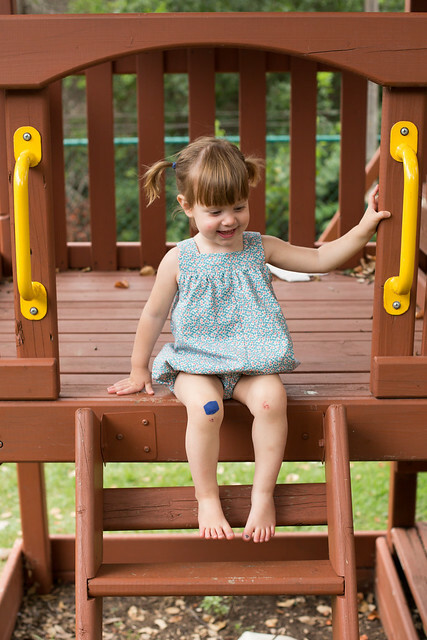 Super cute and the knee Band-Aid is the perfect toddler accessory! Well this is the cutest thing I've seen in a loooong time! I love it! Great fabric. And the she is totally rocking those piggies! Adding this pattern to my must-have list for sure. Awww. She IS looking like a little girl! And the pigtails: Oh. My. GOOD-ness. Amazingly cute! It was certainly worth the extra un-accounted-for time it took to sew . . . the result looks so cute on her! she is adorable! the romper looks so fantastic. you did a great job! 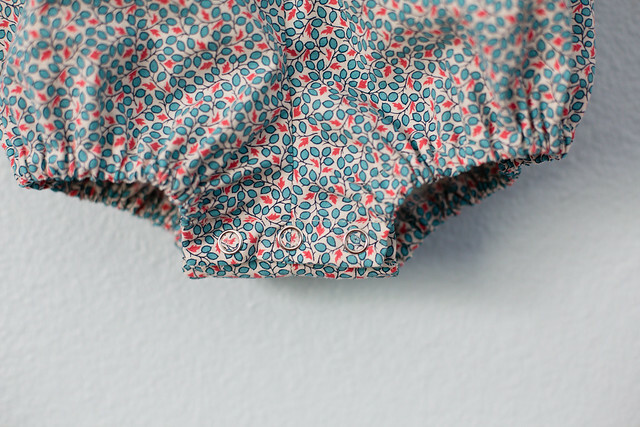 Oh yeah, no mistake there: I can confirm that the romper cuteness factor is officially THROUGH THE ROOF. Cute cute cute cute! I want this pattern for Maggie! 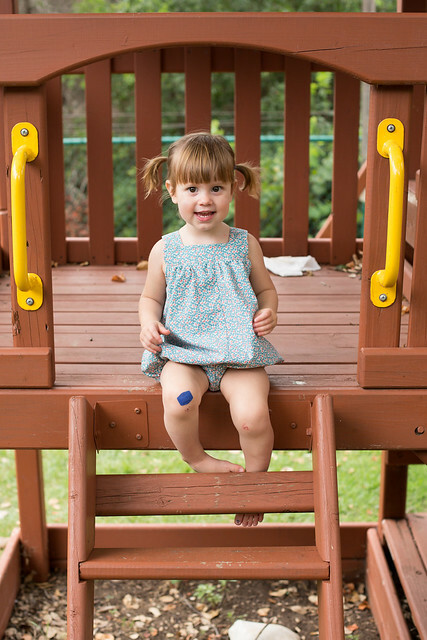 there is really nothing cuter than a toddler in a romper - i love this so so much. perfection. and she is such a doll!